If anyone has any information or photos about Aylor's first log cabin home in Haywood or his parents' home on Deep Run near what is now Novum, please contact us. After the Civil War, Aylor returned to Haywood and re-opened his furniture factory on the old Route 609. Unfortunately, no photos exist in our collection of Aylor's furniture factory. We would be very interested in getting copies of any photos that might exist. If you have any information about his furniture factory or photos to share, please contact us. Aylor then built for himself and his wife a new house and out-buildings known as the Aylor "Home Place." This house was located a few hundred feet from his furniture factory. His property included a small created pond fed by a nearby spring, a foot bridge over the spring, and extensive gardens. 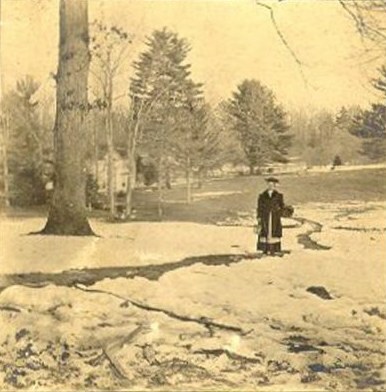 Below is a photograph of one of Aylor's daughters (probably Annie) on the path within the Aylor property leading from the house to the Aylor furniture factory. The front of the home is visible in the distance. Sections of this and other roadbeds within the property still exist with plantings of yucca, daffodils, mock orange, boxwoods, and other flora. 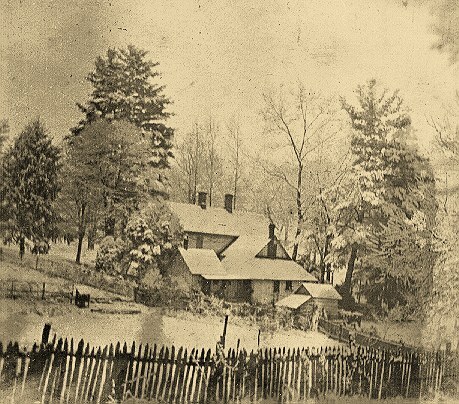 Next to Aylor's property was the Haywood General Store/Post Office and the original Mt. Carmel Baptist Church. (Click here to see several interesting but undated photos of General Store/Post Office and the second Mt. Carmel Church building and a map of historical Haywood). 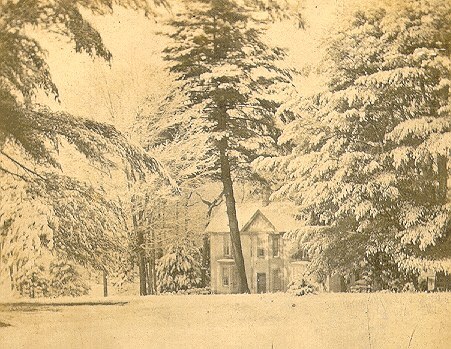 For many years, Albert Aylor and his wife, Mary Frances Broyles (and later three of his children - Bessie Aylor, Annie Aylor Root, and Jacob "Jake" Aylor), lived at the "Home Place" which, by all accounts, was a showplace for Aylor's woodworking and cabinet-making skills. Among other features, the house included a birdseye maple staircase and the rooms were furnished with chairs, tables, bedsteads, and washstands designed and built by Albert Aylor. The house stood vacant for many years. In the 1950s, the house was disassembled for its wood by a local family. The furniture factory was also disassembled in the 1950s. The land on which his house stood remained undeveloped and essentially untouched until the Soho Center purchased it in 2001. All that currently exists of Albert Aylor's house on the "Home Place" are portions of the stone foundation, some brickwork, the front porch (click here for photos of Soho staff uncovering the front porch area), and some of the original plantings, including boxwoods, black walnut trees, yuccas, mock orange shrubs, daffodils, vinca, and ivy. To our knowledge, few photos exist of the interior of the house - although we have several and are continuing to search for and validate additional photographs. We plan to post those we do have on this website once they are identified and validated. Here are some photos of Aylor's home. This first photo shows the front of his home with its distinctive double bay windows and two-story bay-shaped entry. The house faced east. The land sloped downward to a spring about 60 feet from the south side of the house. 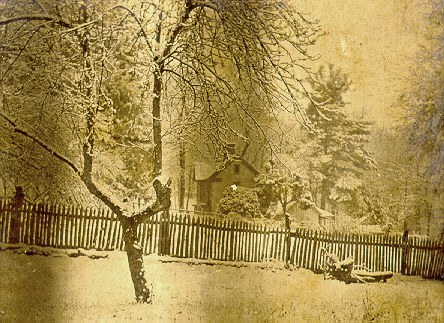 A side view of Aylor's house and picket fencing.